In January, I received the Perky-Pet® Copper Sip & Seed Waterer, you can read that review HERE. For more info on Perky-Pets and the different styles and kinds of bird feeders they can look at their website HERE. This innovative squirrel proof feeder keeps squirrels from raiding the bird seed. 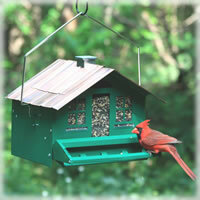 The home style appearance of this delightful feeder will attract birds - and birdwatchers, too!! The Perky-Pet® Squirrel-Be-Gone™ II wild bird feeder features a weight activated perch bar that closes to prevent squirrels from accessing the seed supply. Adjustable springs can be calibrated to accommodate different birds sizes and keep away nuisance birds as well as squirrels. This Squirrel-Be-Gone™ feeder comes in a classic home style design with all metal construction and a removable roof peak for easy filling. If there are any bird enthusiasts or wildlife admirers in your life, this Squirrel-Be-Gone™ feeder is the perfect gift! The Squirrel Be Gone is $34.82. That's a great price to pay for such a great bird feeder! Its well made and holds lots of feed! The kiddos know what the Perky-Pets boxes look like now and they get so excited to reviel the new bird feeder for the month! The Squirrel be is a large Country style house bird feeder. The rooster on the top opens so that you can add the feed. This bird feeder would not hang from any of our trees because of the size and weight. We had to nail 2 pieces of 2X4's together to make an L shape stand for the bird feeder. The kids run out there every day to see how much seed has been eaten. They also like watching from the window to see which birds come by. This is the cutest bird feeder I have ever seen! I luv the lever that closes when a squirrel steps on it. The first bird feeder i got to review is a haven for squirrels. They have learned to scoop the seed out of the Perky-Pet® Copper Sip & Seed Waterer. Its funny watching the squirrels scooping the seed but the seed is for the birds not them. That leaves more for the birds! ~ Yippie! The kids and I like looking at the Wild Bird Species Library to see what kinds of birds come for a visit. We have seen lots of Blue Jays and Woodpeckers in our local area since the feeder has gone up. disclosure~ I received the squirrel Be Gone from Perky pets in sxchage for this review. all opionions are all my own.